When falling in love isn’t part of the contract. Techie Ethan Mattson may have married chef Lily Harper but he didn’t vow to love her. His only commitment was to hand her half of his business assets and a year later file for divorce while saving a tidy sum on taxes. Little does Ethan know that the pretty woman from his past needs so much more than just a business. She needs protection and love, the two things he feels too broken to offer. Chef Lily Harper grew up tagging along after Ethan who saved her from bullies, mud puddles and being an outsider. When Lily flees a nasty ex who won’t take a hint, she comes running home to Blueberry Springs, striking a deal with her childhood protector, Ethan. If he marries her, she’ll take his restaurant off his hands, giving him more time to spend on his dream tech business. Not only that, but she’ll finally earn her way into owning a thriving restaurant. It seems like an ideal agreement…until she begins to fall in love. Will Lily be able to show Ethan how to love again or will their hidden histories ruin their recipe for love? 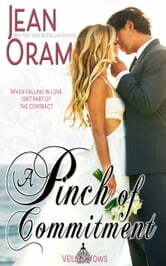 Find out in this irresistible new book from New York Times bestselling author Jean Oram. 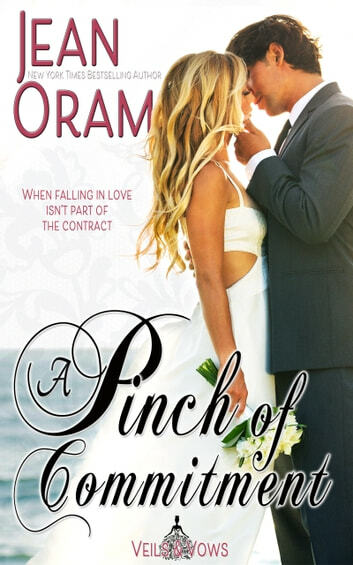 A Pinch of Commitment is the second book in the Veils and Vows series and it can be read out of series order and as a standalone. Start reading it today! I didn't even manage to get one chapter in before both Ethan and Lily had stolen my heart! They are very different characters, but both have graduated from the school of hard knocks and as a result both have walls....HUGE walls protecting their hearts. But deep down....deep, deep, deep down they have always loved each other - they just need to remember this and nurture the seeds of love that remain, feeding it, protecting it and allowing it to blossom into something beautiful. Of course Ethan being grumpy, short tempered and self doubting and Lily being feisty, pushy and outspoken results in plenty of fireworks, misunderstandings and confrontations, but these are cradled between scenes of love, passion and understanding that cause a tear to fall on more than one occasion. This is my favourite book of the series and will be read again and again - fantastic! A Pinch of Commitment is a wonderful, sweet romance. Ethan and Lily will grab your heartstrings and pull. Hard. They are a dynamite couple who have a firm foundation for their love to blossom, grow, and withstand the storms of life. They deserve an HEA after what they have each endured. Ethan was introduced in The Surprise Wedding as Devon's brother. If you loved Devon, you will love Ethan. They share the same core values and when they love, it is with their entire being. If you haven't read Devon's story, what are you waiting for? It is an awesome 5 star story. If you like stories that are well-written, with characters that are everyday people, and a top-notch story, look no further. A Pinch of Commitment is the book for you. Actually, all of Jean's books are awesome and I recommend reading everything this talented author writes.